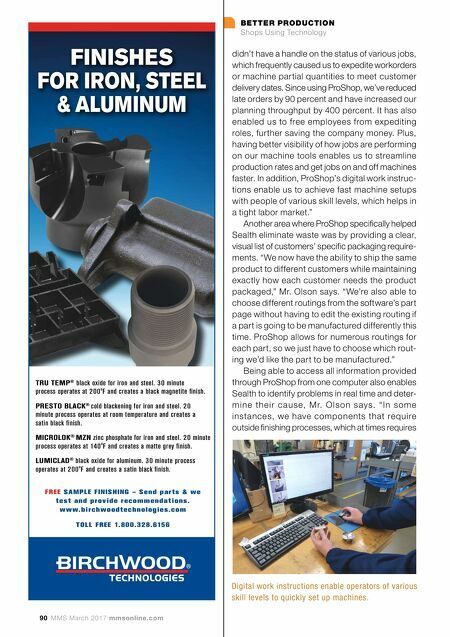 BETTER PRODUCTION Shops Using Technology 90 MMS March 2017 mmsonline.com didn't have a handle on the status of various jobs, which frequently caused us to expedite workorders or machine partial quantities to meet customer delivery dates. Since using ProShop, we've reduced late orders by 90 percent and have increased our planning throughput by 400 percent. It has also enabled us to free employees from expediting roles, further saving the company money. Plus, having better visibility of how jobs are performing on our machine tools enables us to streamline production rates and get jobs on and off machines faster. In addition, ProShop's digital work instruc- tions enable us to achieve fast machine setups with people of various skill levels, which helps in a tight labor market." Another area where ProShop specifically helped Sealth eliminate waste was by providing a clear, visual list of customers' specific packaging require- ments. "We now have the ability to ship the same product to different customers while maintaining exactly how each customer needs the product packaged," Mr. Olson says. "We're also able to choose different routings from the software's part page without having to edit the existing routing if a part is going to be manufactured differently this time. ProShop allows for numerous routings for each part, so we just have to choose which rout- ing we'd like the part to be manufactured." Being able to access all information provided through ProShop from one computer also enables Sealth to identify problems in real time and deter- m i n e th e ir c au s e, M r. O ls o n s ays. 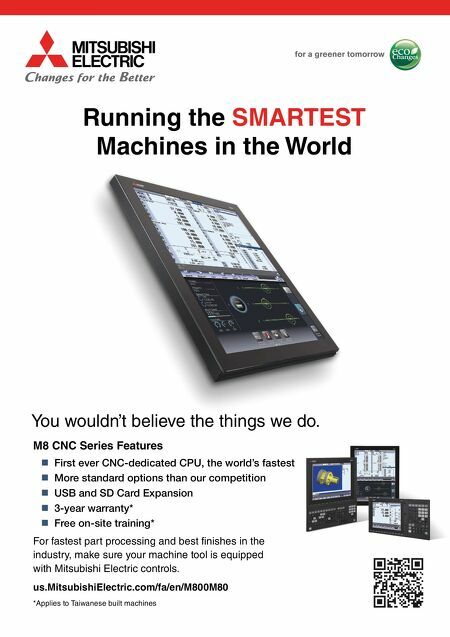 "In s o m e instances, we have components that require outside finishing processes, which at times requires Digital work instructions enable operators of various skill levels to quickly set up machines. FINISHES FOR IRON, STEEL & ALUMINUM FREE SAMPLE FINISHING – Send parts & we test and provide recommendations. www.birchwoodtechnologies.com T OLL FREE 1.800.328.6156 TRU TEMP ® black oxide for iron and steel. 30 minute process operates at 200 o F and creates a black magnetite finish. PRESTO BLACK ® cold blackening for iron and steel. 20 minute process operates at room temperature and creates a satin black finish. MICROLOK ® MZN zinc phosphate for iron and steel. 20 minute process operates at 140 o F and creates a matte grey finish. LUMICLAD ® black oxide for aluminum. 30 minute process operates at 200 o F and creates a satin black finish.